1988. Two eight-year-old girls meet for the first time. With almost identical names and a passion for ballet, the girls become best friends. 2016. The two girls - now grown women - have led very different lives since they last saw each other two decades ago. One has been homeless for most of her adult life, the other became a nun. Though bound by a secret from their past, the women are no longer friends, no longer even acquaintances. But their past is catching up with them and the women are on course to reunite and deal with the secrets that set them on their current paths. As a massive fan of Dorothy Koomson, I've been eagerly awaiting the publication of her latest novel and I wasn't disappointed as I delved into the stories of Roni and Nika. I was quickly drawn in by Dorothy Koomson's beautifully crafted words, intrigued by the secrets the women held. The book reminded me a lot of The Ice Cream Girls, one of Dorothy's previous novels, with the two female protagonists bound by their shared past which has set them on completely different paths in life. As The Ice Cream Girls is my favourite Dorothy Koomson book to date, this was no bad thing at all! Childhood friendships often don't stand the test of time but it is clear something drove these girls apart, pushing them to such extreme circumstances. I was gripped by the stories, particularly Nika's as the true horrors of her life since she disappeared from her home at seventeen are revealed. I quickly connected to her, gripped by her story and while she's learned to shut down her feelings and therefore rarely shows them, the emotions jumped off the page through the writing. Nika has suffered some truly dark moments and I often feared what was around the corner for her. There are a lot of damaged relationships within the book, whether between parent and child, lovers, friends and family and for me, some of the most heartbreaking aspects of the book centred around these cracks. The raw emotion as Nika is let down by those she trusts the most, those who should love and protect her no matter what, is palpable and I felt her devastation. I also felt for Roni too but it was Nika I felt the strongest connection to, who I felt compelled to keep turning the pages to find out how it was all going to turn out for. Nika is such a strong character - because she's had to be to survive and I was hoping she'd be able to soften by the end, to be able to let down that guard she'd needed to protect herself for so many years. I loved the book in a my-heart-just-might-break-any-minute kind of way﻿ as I went on quite an emotional journey with Nika and Roni. There's sadness, fear and anger in abundance but there are also uplifting moments, moments of love and friendship that shine through all the torment. 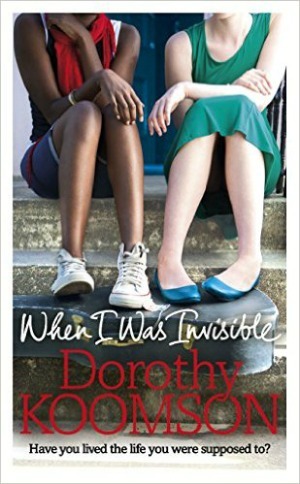 When I Was Invisible takes a glimpse into the harsh reality of what life is like for some and while it wasn't always a comfortable read, it was certainly powerful. I was gripped by the book, by the characters and by the hope for the future for Nika and Roni. I was quite late to discovering Dorothy's books (The Woman He Loved Before was the first I read) but I've been catching up. Only have The Chocolate Run to go now!